First class facilities, unbeatable location & Caribbean vibe!! About Bocas: discover Panama's coolest beach town. School's Location and Opening Hours: we're on Isla Colon, Bocas' main island, close to everything: restaurants, bars, hotels and just a short walk or boat ride to loads of beaches and surf breaks. Air-Conditioned Classrooms: designed to allow maximum interaction between students and teachers and to provide utmost comfort for dynamic learning. Students' Balcony, Garden and Chillout Area: do your home work or just relax and socialize while enjoying the fresh Caribbean breeze and wifi. Habla Ya Spanish School in Bocas del Toro is accredited by the Instituto Cervantes, the worldwide authority for teaching Spanish as a foreign language. Habla Ya Bocas del Toro is also an Official DELE Examination Center and a proud member of BSTA, the Bocas del Toro Sustainable Tourism Alliance. What's it like to study at Habla Ya Bocas del Toro? 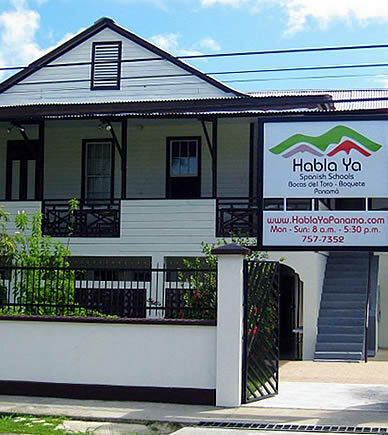 Habla Ya Spanish School is Bocas del Toro's most and best reviewed school. Between TripAdvisor, My Language Travel, 123 Teach Me and other online sites, Habla Ya Bocas del Toro has more than 200 perfect 5 star reviews. The Bocas del Toro Archipelago is a scattering of 7 major islands and more than 250 cays and islets off the northwestern coast of Panama. The region has all the elements you could dream of in your wildest Caribbean fantasy: postcard perfect white and golden sand beaches lined up with coconuts and palm trees, thatched-roofed huts, emerald waters perfect for scuba diving treasured with abundant sea-life including dolphins, sea turtles, tropical fish and manatees, a thick tropical rainforest with sloths and howler monkeys, seasonal consistent-world class surf breaks and a soft ocean breeze. Add to that a funky, laid and chilled back vibe, a throbbing island nightlife and a friendly local population, and it's easy to see why Bocas del Toro is quickly emerging as an eco-tourism/beach hot spot faster than any other part of Panama. Bocas del Toro is easily accessed by air through daily 45 minute flights from Panama City or a 3 hour drive and 30 minute boat ride from Boquete, where our first Spanish school is located. The domestic airlines who offer these flights are Air Panama and Nature Air. When planning to study Spanish at any of our Spanish schools (or at several of them! ), we will help you make these flight arrangements at no extra cost. During the weekends we also provide a shuttle service between our schools in Boquete and Bocas. If you're visiting Bocas del Toro, it's impossible to miss us. We're located on Isla Colón, the main island, in Bocas Town, on the road that leads you out of town and takes you to Isla Colon's most beautiful places such as Bluff Beach, Boca del Drago and Starfish Beach. Besides, everybody in Bocas del Toro knows where Habla Ya is. Just ask! Our exact physical location (map just below) is on the southern corner of G Avenue and 9th Street, just a block before the hospital or a 10 minute walk from Bocas del Toro's Central Park. We are in a quieter place of town ideal for Spanish learning, but still within a 5 minute walk to bars and restaurants such as the Casbah and Mondo Taitu and literally only a couple minutes walk to many of Bocas del Toro's hotels. And if you want to quickly hit the beach, our School in only a 7 minute walk to Playa El Istmito, a 3 km stretch of beach with gentle waves popular amongst locals. Our physical address is Habla Ya Spanish School, Avenida G y Calle 9va Sur, Isla Colón, Bocas del Toro, Panamá. But DO NOT send post to this address because mail in Panama is not delivered to your door as it probably is in your country. We use POST BOXES! And sadly enough the service is slow. If you want to send a package or a letter to anyone at Habla Ya Bocas del Toro Spanish School, direct it to: the PERSON'S NAME, Entrega General, #0101, Isla Colón, Bocas del Toro, República de Panamá. Post to our Spanish School should be addressed to Carlos Raúl Cabrera Toledo or Julio Santamaría. Upon entering our Spanish School in Bocas del Toro you'll encounter the school's Front Desk area, a beautiful tropical garden with tables and chairs, a hallway that leads you to the classrooms and a stairway that leads you to the school's balcony area, the cafeteria and TV & chill out area. At our Front Desk you'll be greeted by Cesar (our School Director), Christopher (our Customer Experience Director), or Aicel (our Academic Director) who always give our students a warm welcoming. At our Front Desk we also take care of our student's accommodation so our team will be able to take you to your host family or direct you to your hostel, hotel or apartment after arriving to our Spanish school. Our tours, excursions and get-togethers are organized by our Customer Experience Director but everyone at our Front Desk can always help you out so that you enjoy Bocas del Toro's tropical waters and experience its nightlife during the weekend. If you need help with anything, this is where to go. Most of the classrooms are located on the ground floor. On the upper floor you'll encounter a large balcony area to enjoy the fresh breeze from the sea, as well as the TV & Chill out area. The teachers' Academic Department and our Language Travel Consultant's office space are also located upstairs, as well as several of Habla Ya's teachers living quarters so there is also a private area for them. At our Front Desk you'll always find Aicel, César or Christopher willing to help you out with anything you might need. 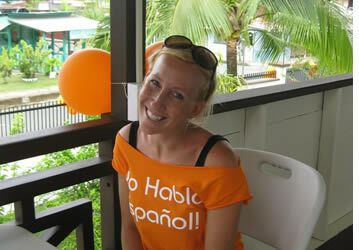 Their job is to make sure that you live the most amazing Spanish learning experience in Bocas del Toro! Bocas del Toro is a tropical island and needless to say, despite the fresh Caribbean breeze from the sea, it will get hot and humid (click here for more information about Bocas del Toro's weather). As we strive for academic excellence we are aware that when you're studying Spanish you require to be in a comfortable, stress free and adequate environment. Each of the classrooms at our Spanish school in Bocas del Toro is air-conditioned and thus we ensure that the heat and the sweat stay out of your Spanish lessons and we provide you with a nice temperature so that your brain can function. And for those days when it's not too hot, we also have fans in each classroom so that we don't have to use the air conditioning unnecessarily. Each classroom is adequately illuminated and properly ventilated each day to facilitate student's concentration for longer periods of time. Tables and chairs are ergonomically designed to ensure everyone's comfort and the furniture is laid out to allow maximum interaction between the students and their teacher. The whiteboard can be easily read by everyone in the classroom. Did we mention that groups are always small with never more than 6 students (average 3 - 4) ensuring that you received the personalized attention required to learn the langauage? Each classroom at Habla Ya Bocas del Toro Spanish School can comfortably fit 6 Spanish students plus your Spanish teacher (in reality there is space for more but we limit groups to 6 per class) and is named after a famous Panamanian, Spanish or Latin American writer: Cervantes, Neruda, Mistral, Vargas Llosa, Borges, Quevedo, Miró and Cohelo. Besides having classes at our Spanish school, we take our students on strolls to Bocas del Toro's streets and neighborhoods to make sure you get to practice your Spanish in real life situations, or we just walk by the beach. During these strolls our language students learn many nouns and adjectives, practice the topics that they've been studying in class and get a chance to enjoy the fresh air. Students in our Group 4 course go on 2 hour strolls every Friday and those of our Crash Course for New Residents go once every 2 weeks. Depending on the group and on the student's level, strolls may take place more than once a week. 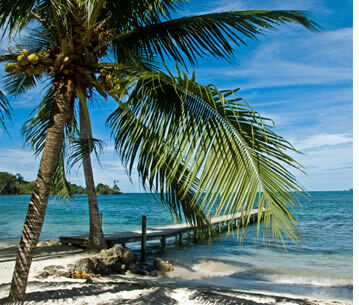 Studying Spanish in Bocas del Toro is like studying Spanish in paradise. With all its beaches, wildlife and natural beauty in general, you have to make sure that you also practice your Spanish outside of the classroom and don't get too distracted by Bocas del Toro's wonders. Our balcony is a place where our students can do their homework, sit down with their laptop and surf the internet or just take a pause after classes to catch some fresh breeze from the sea. Students can also spend time in our tropical gardens with teachers and classmates while enjoying a refreshing glass of water. In addition to our gardens and balcony, we also have a kitchen and TV area, where students can store their food in a fridge and heat it up in a microwave or do their homework on one of the tables. Movie nights, Panamanian dinners, salsa lessons and conversational sessions also take place in this area. At Habla Ya Spanish School in Bocas del Toro we share a 3 Mb internet connection. It may not be as fast as what you're used to in your country (1, 3 or 10 Mb)... welcome to the digital divide! If we do not download music, videos or any large files everybody will be able to surf the internet! If you require a larger bandwidth there are plenty of internet Cafés in town where you can get higher connection speeds. Although most students only have 4 hours of lessons per day, you're more than invited to spend any amount of time you'd like at our Spanish School in Bocas del Toro. Caribbean hacienda style campus just a short walk from the beach! Contact us!